Are you looking for a new recipe to add to the rotation? Then you are most definitely going to want to try this one! This pasta may look like somewhat of a mess, I was hesitant to share because the photos don’t do this pasta justice (and it’s one of those things where the noodles absorb all that saucy goodness before you can get a nice pic), but it was seriously too good not to share! 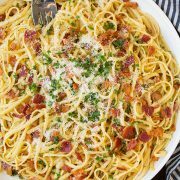 This pasta is perfectly creamy and it has just the right amount added flavor from the parmesan, Neufchatel cheese and the garlic. 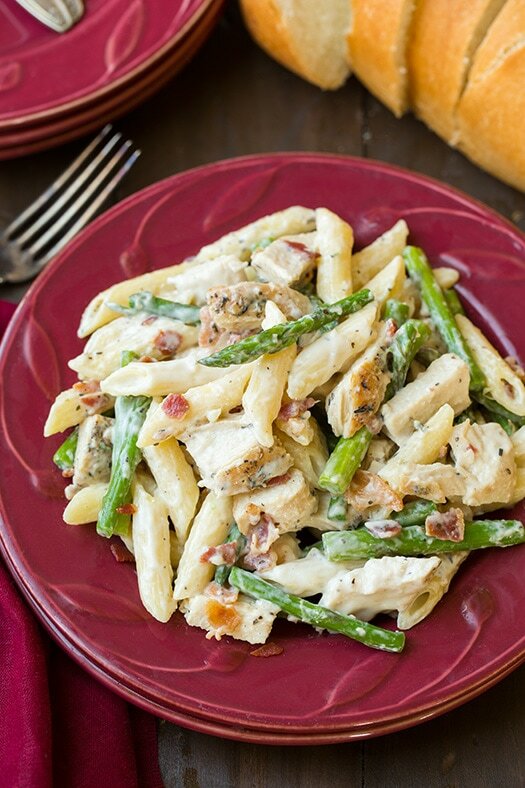 After the pasta is tossed in the lighter alfredo style sauce, it is then upgraded with a few of my favorite dinner ingredients – herbed chicken, fresh asparagus and salty bacon. You can never go wrong with bacon, right? 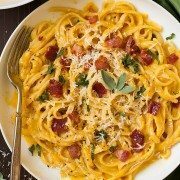 I listed the bacon as optional in case you want to keep it healthier but if you are willing to splurge a little it really makes this pasta so delish! 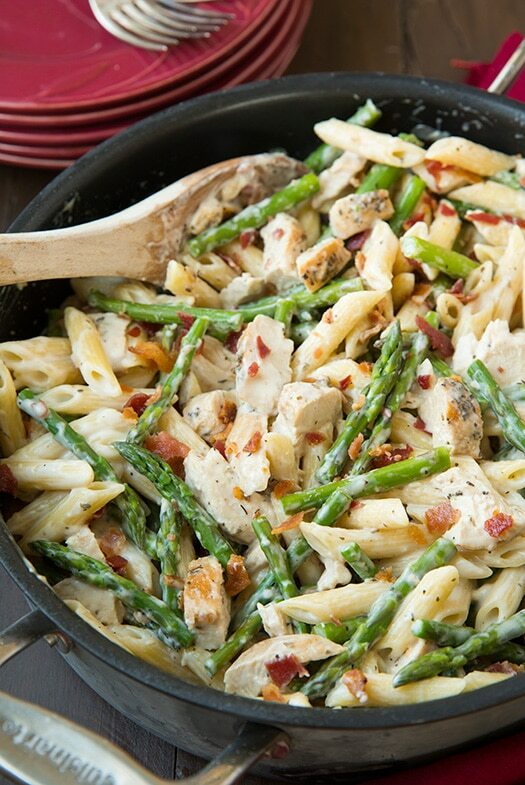 Even though this pasta takes a few steps and a few pans, it is more than worth it! Enjoy! 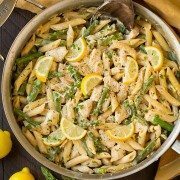 This pasta is perfectly creamy and it has just the right amount added flavor from the parmesan, Neufchatel cheese and the garlic. In a small bowl, stir together basil, oregano, thyme and 1/4 salt and pepper. 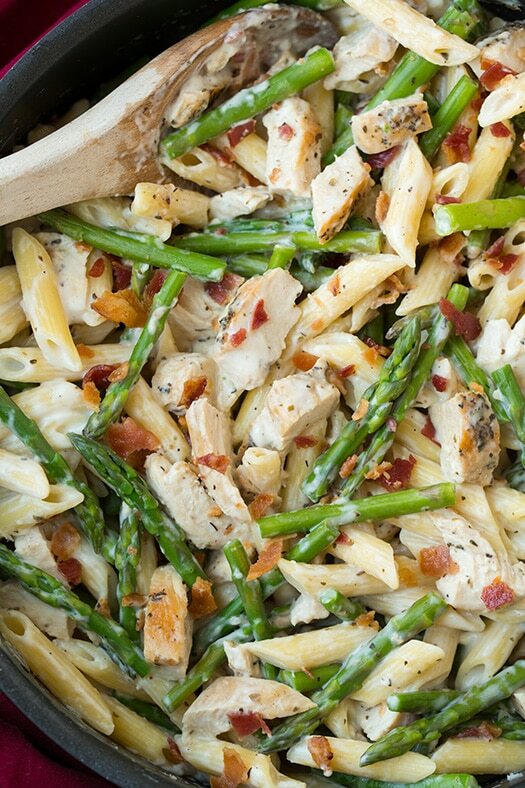 Sprinkle half of the herb mixture evenly over tops of chicken. Heat olive oil in a non-stick skillet over medium-high heat. 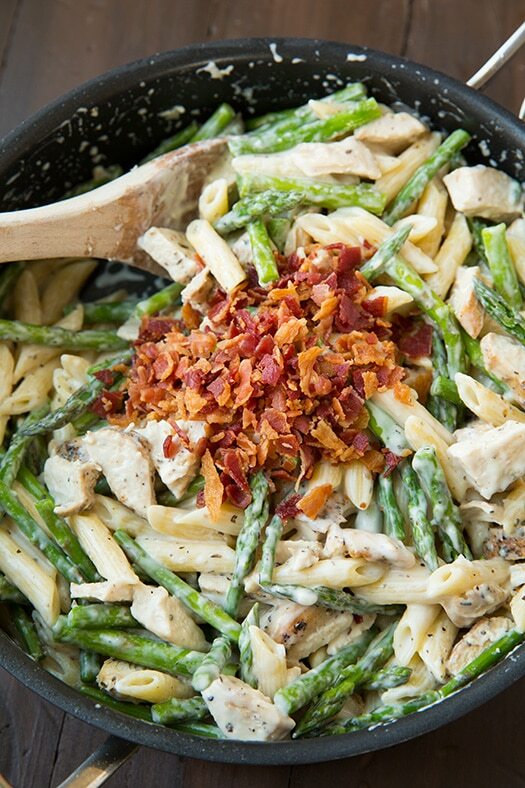 Once hot, add chicken to skillet, herbed side down, then add remaining herb mixture to tops of chicken. Cook chicken until fully cooked through, about 8 - 12 minutes, occasionally rotating chicken (time will vary based on thickness of chicken breasts. If chicken is browning too quickly reduce heat to medium low as needed). Transfer cooked chicken to a plate, let rest 5 minutes then dice into pieces. In a clean skillet (large and deep), melt butter over medium heat. Whisk in flour and cook 1 minute, stirring constantly, add garlic and cook 30 seconds longer, stirring constantly. While whisking, slowly pour in milk then cream (whisk vigorously to break up clumps). Season with salt and pepper to taste (a fair amount of each) and bring mixture to a boil, stirring constantly. 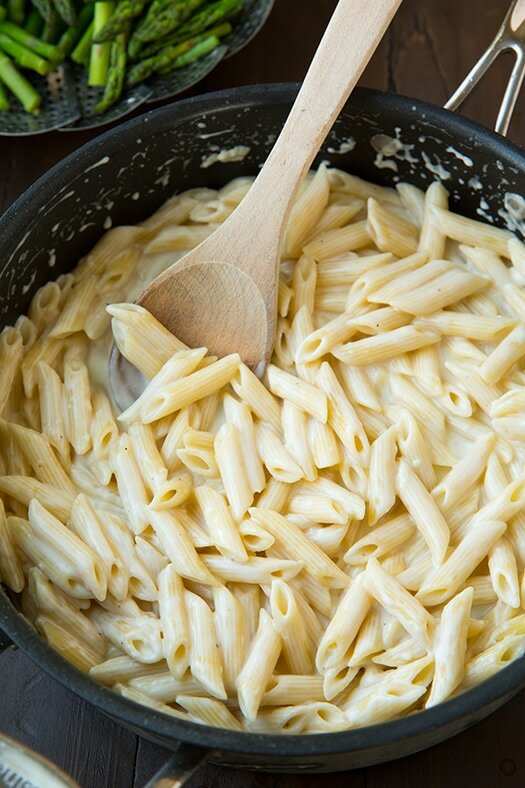 Once it reaches a boil and thickens, reduce heat to medium-low, add Neufchatel and parmesan cheese and cook, stirring frequently, until cheeses have melted.